A hearty farro risotto made vegan with a delicious walnut cream sauce and rosemary roasted butternut squash. Perfect for fall! Place walnuts in warm water and let soak while making the risotto. Start the risotto. Heat a large pan over medium heat. Add the olive oil followed by the onion. Cook until the onion is fragrant and soft; 8 or so minutes. Stir in the farro and cook for one minute, letting farro toast. Add in the wine and continue to cook for about 2 minutes until most of the wine has cooked away. Add 1/2 cup of the stock and stir. Let risotto cook until nearly all the stock broth has been absorbed. Add another 1/2 cup and let absorb again, repeating the add broth/let absorb, stirring frequently, until the farro is just about tender, about 40 minutes. You might not use all four cups- just taste along the way until the farro is tender. Heat your oven to 425˚F. 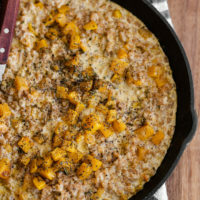 While the farro is cooking, peel and cut the butternut squash into ½” cubes. Place on a sheet tray and toss with the rosemary, olive oil, and salt. Toss until the squash is well coated. Roast until the squash is tender and starting to brown, around 30 minutes. Finally, make the walnut cream. Drain the soaking water and place the walnuts in a blender. Add the water, garlic, lemon juice, and salt. Puree until smooth, adding a splash or two more water as needed. Once the farro is tender and most of the liquid has been absorbed, stir in ¾ of the butternut squash and the walnut cream sauce. Stir and let cook for 4 to 5 minutes, until the cream sauce has thickened a bit and the risotto looks creamy. Divide into four bowls and top with remaining butternut squash and freshly cracked black pepper.